We haven’t had a local fossil featured on this blog for awhile. 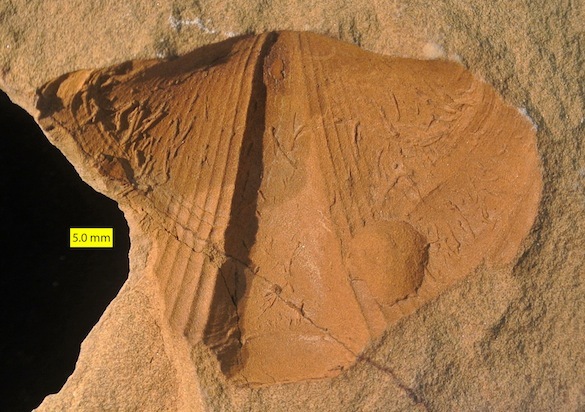 Above is an external mold of the spiriferinid brachiopod Syringothyris typa Winchell, 1863, from the Logan Formation (Lower Carboniferous, Osagean, about 345 million years old) of southeastern Wooster, Ohio. The outcrop is along the onramp from north Route 83 to east Route 30. Older Wooster geologists may remember this area was called “Little Arizona” because of the large roadcuts made for a highway bypass that was never completed. That original outcrop was destroyed several years ago, but the same rocks are exposed in this new section. This is the area where Heather Hunt (’09) did her Senior Independent Study work, and long before her Brad Leach (’83) worked with the same fossils. The Logan Formation is primarily fine sandstone, with some subordinate conglomerates, silts and shales. It was likely deposited in the proximal portion of a prodelta at or below wavebase. The fossils in the Logan are mostly these large Syringothyris and the bivalve Aviculopecten, along with scattered crinoids, gastropods, bryozoans, nautiloids and ammonoids. This fauna needs more attention. Funny how the fossils in your own backyard are so often ignored. This brachiopod was first buried in sediment and then the shell dissolved away, leaving an impression behind. Since it is an impression of the exterior of the shell, it is called an external mold. Curiously, all the external molds (and the internal molds as well) in the local Logan Formation have an iron-rich, burnt orange coating much finer than the fine sand matrix. This means that details are preserved that are of higher resolution than the matrix alone would allow. In the case of this fossil, that coating extended down into long, narrow borings in the shell, casting them (see below). These borings are odd. Most of them are parallel to the ribs (plicae) of the brachiopod, and appear to have been excavated from the shell periphery towards its apex. This was in the opposite direction of brachiopod shell growth. I suspect they were made by boring annelid worms that started at the growing edge of the shell where the mantle ended. 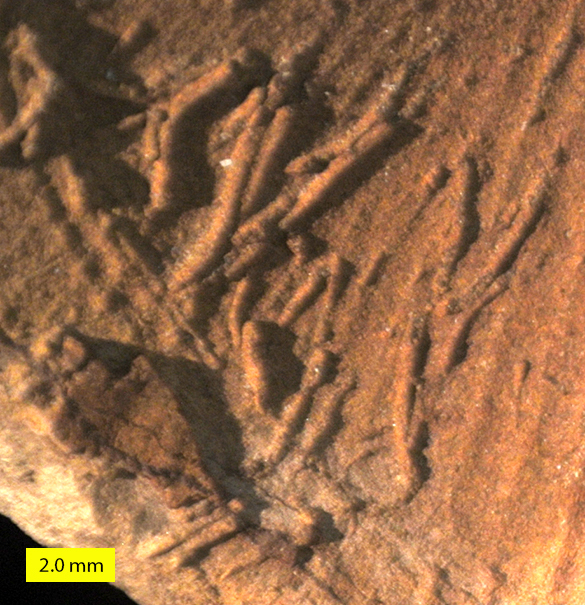 These traces need attention, like most other aspects of this local fossil fauna. Ausich, W.I., Kammer, T.W. and Lane, N.G. 1979. Fossil communities of the Borden (Mississippian) delta in Indiana and northern Kentucky. Journal of Paleontology 53: 1182-1196. Bork, K.B. and Malcuit, R.J. 1979. Paleoenvironments of the Cuyahoga and Logan formations (Mississippian) of central Ohio. Geological Society of America Bulletin 90 (12 Part II): 1782-1838. Leach, B.R. and Wilson, M.A. 1983. Statistical analysis of paleocommunities from the Logan Formation (Lower Mississippian) in Wayne County, Ohio. The Ohio Journal of Science 83: 26.